← Sean Ardoin and Zydekool’s “Alternative Creole” (Acadiana Living. April 2015). 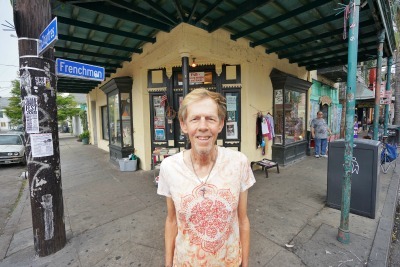 2 pieces: Poet Bill Lavender & Faubourg Marigny Art and Books (FAB) (NewOrleans.me. May 2015). Faubourg Marigny Art and Books : remains the funkiest spot on all of Frenchmen Street. Just outside you’ll find an impressive collection of antique postcards, decades-old Mardi Gras baubles and posters, an old cordless telephone, a black, Hello Kitty baseball hat, and a photo-smart printer, still in its box. Also there are books – strewn about in a way that makes them tough to catalog but fascinating to sift through. The joke goes that, inside, Otis Fennell usually sells hard-to-find books – though these days he keeps things a little better organized. “That’s a major change for me; I have it cataloged for the first time to sharpen the focus on the books I have to make it easier for people to find and buy them,” chuckles Fennell, who theoretically knows where in his store you can find everything from the latest New Orleans titles (a sharply up-to-date collection), to your favorite early edition classic literature, your favorite 70s coffee table photography book, or your favorite 80s gay magazines.